Make your reservations for this spacious, two-bedroom, two-bath condominium located on the white sand beaches of unspoiled Navarre Beach, Florida. Our unit #405 at The Pearl of Navarre Beach contains a fully-equipped kitchen, dining area, wet bar and spacious living within 1378 square feet. The large, fourth-floor, private balcony overlooks two pools and hot tub and offers a gorgeous view of The Pearl's beautiful beach and the Gulf's turquoise-blue waters. Master bedroom contains a king-sized bed, very large walk-in closet, luxurious Jacuzzi bath, and separate glass-enclosed shower. Full view glass wall with two sliding doors provides the soothing sounds of the waves as well as panoramic Gulf views from both master bedroom and living room. Guest bedroom contains twin beds and a large closet and guest bath has a large shower/tub combination. Because the property is located on a barrier island between a county park and a national seashore park, the area is quaint and unspoiled; with over 20 miles of federally protected sugar white beaches. However, popular Pensacola and Destin are only short drives away (15-25 miles). Your visit will be completed with views of porpoises, stingrays, and a variety of native game fish from the nearby fishing pier. The sunrise and sunset views from the balcony are also spectacular. This vacation rental is perfect for families and couples. This is a non-smoking unit and pets are not permitted. Secured parking lot available for autos, RV, boat or trailer. seating for 6 overlooking the pools and beach area. Spectacular views of the sunset and sunrise. boogie boards, floats, beach toys, some fishing gear, nets, beach chairs and umbrellas provided. Also a beach wagon. As far as the overall property, we have stayed at the Pearl before and everything is kept really tidy and nice. The staff are cleaning every morning and you can tell the place is well cared for. One pool is heated and one is not. The heated pool was very useful for March as the unheated pool was cold. The hot tub was nice as well to warm up and relax. There are also gas grills and charcoal grills on site which we used as well. When we come back to Navarre, we will be staying here again. The condo was lovely! It was clean and had had everything we needed for our week in Navarre. Our stay was great! The condo was lovely, clean and had everything we needed for our week in Navarre!! Great location. 405 Pearl was beautifully laid out and decorated. The beach is stunning. Property was well maintained and beautifully situated. We did not use the pool or hot tub due to cold and turbulent weather but they were inviting and clean. Access to property through main gate was easy. Parking excellent. Access to the beach was easy. Close proximity to restaurants and grocery stores was convenient but more important, easy access to the Gulp Islands National Recreation Area provided pristine, meticulous, crystal clean beaches with few people. The Fort Pickens park and museum are true historical treasures. The only minor complaint I might submit is that at the Pearl Condominium complex, the gas grills were out of gas the entire time. An employee there said the gas was son order but did not know when it would be in. We used the charcoal fired gas grills but cold and turbulence made this difficult. Over all, we enjoyed Navarre beach, the area and the Pearl Complex. 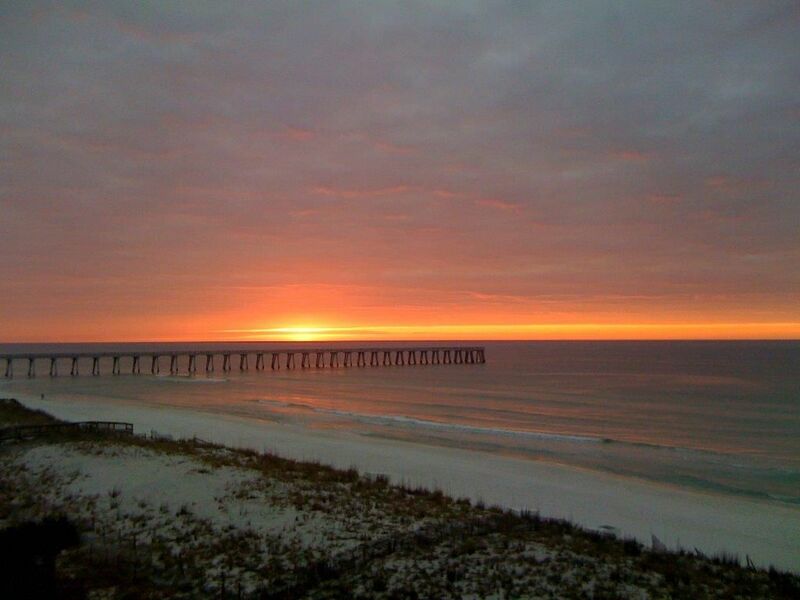 Beautiful comfortable condo overlooking one of the prettiest beaches in the Florida panhandle. Perfect condo and unit. We had a wonderful week. Thank you! 1450-foot Gulf Fishing Pier (opened 7/2010) at end of Navarre Beach Causeway; 15-mile Bike Path thru Gulf Islands Nat'l Seashore to Opal and Pensacola Beach and historic Fort Pickens; Free Boat Ramp and rentals across the street at Juana's Tiki Bar; multiple Golf Courses. Miles of quite Beaches to explore and fish.